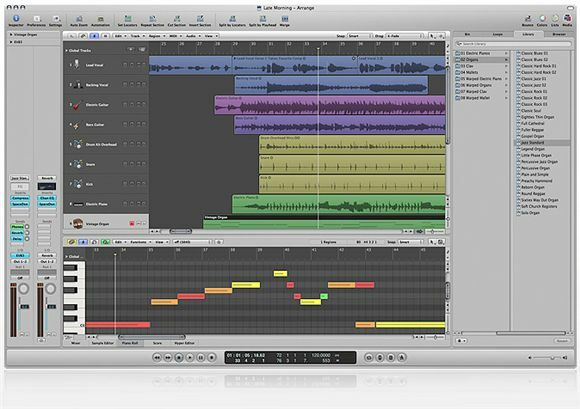 My review of Apple’s Logic Studio (including Logic Pro 8) is now live at Macworld.com (it’ll also be in the January 2008 print issue). Pros: Single-window view speeds editing and setup; MainStage program ideal for playing instruments and effects live; powerful, easy-to-access editing and take management tools; bundles Soundtrack Pro but halves the price; no more dongle; can sync with others via .Mac or Bonjour. Cons: Some MIDI features are still obscure; MainStage doesn’t integrate with Logic or ReWire. Or, to put it more simply: take away a dongle, slash the price, and make Logic easier to use, and you’ve got a winner. It’s a really strong release, but readers of this site may be equally interested in what I felt like were the weak points in Logic 8. MainStage to me is much less useful as a performance tool because of its inability to integrate directly with Logic itself or other programs (Ableton Live, Reason) via ReWire. Maybe you don’t need a complex performance setup, but I suspect even beginning users may still want basic Logic backing tracks. It’ll be interesting to see if this gets addressed in a future version. In the meantime, there’s still a big window of opportunity for creating live performance setups in Ableton Live (further facilitated by Live’s new drum racks and time signature support), or instrument/effects racks in KORE 2, both of which we hope to get our hands on here soon. And the other shortcoming for me has to be the fact that MIDI editing in Logic 8 still feels like MIDI editing in Logic 5. Basic tasks like quantizing a track or adding an arpeggiator just aren’t as easy in Logic as in some of its competitors. Contrast the rich MIDI editing tools that were further enhanced in SONAR 7. Cakewalk wants to talk about audio mastering and 64-bit, but what we heard from readers here was that good old bread-and-butter MIDI actually got you more excited, because it’s what you use day in and day out. On the other hand, SONAR’s interface looks even more cluttered next to the elegant new single-edit window in Logic, to say nothing of the fact that a lot of people are happy with Ableton Live as a DAW. But that couldn’t make me any happier: the race is on. The big picture: I think the great days of music creation software are back. Competition is thick, you’ve got real choice in platform (Windows, Mac, and yes, even Linux via Ardour), and software is focusing on how you work creatively as a musician rather than a me-too feature contest. Now that the review is up, I look forward to hearing what you think of my take. Software this deep really is a subjective thing, and there’s no space to cover the endless technical details. So sound off.